Rummaging through the samples I brought back from IPCPR 2013, I came across the JC Newman Brick House Maduro, in robusto (5″X54). Previously only available in 6″X60, this new offering piqued my interest. 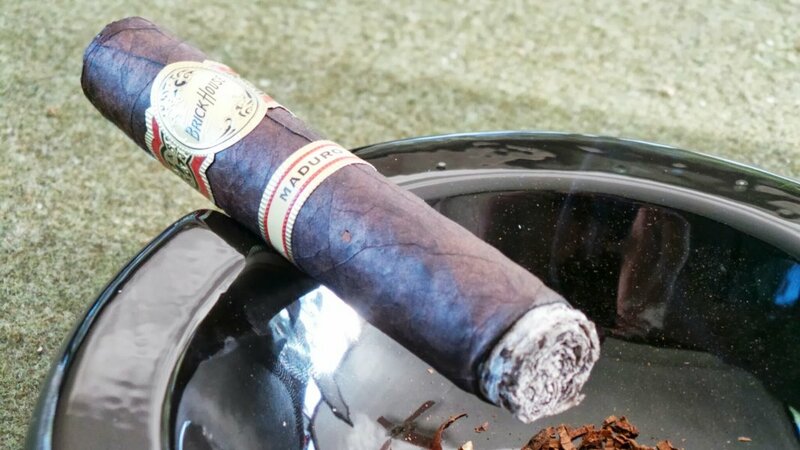 I tried the Mighty Mighty Maduro last year, but can’t say that I had revisited the line because I’m not typically a fan of the larger ring cigars. While the flavors in that stick were enjoyable enough, I’m just not especially comfortable smoking the size. I do, however, enjoy the standard Brick House line – especially in the robusto format. 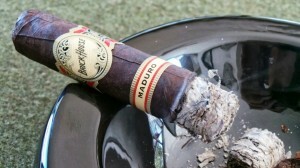 I am also a maduro fan, and nearing fanboy status with Aripiraca wrapper leaf. I was eager to put fire to today’s featured cigar after noting in the press release that it carries a Brazilian Aripiraca wrapper and a Nicaraguan binder/filler blend. Much of my experience with JC Newman is with their Fuente-made Diamond Crown lines, and Perla del Mar from their San Rafael factory in Nicaragua, with the addition of the standard Brick House robusto – which, along with the Brick House maduro, is also produced at their Nicaraguan factory. The Brazilian wrapper on the Brick House Maduro is a very deep, dark brown color with but a slight oily sheen. The samples I received were moderately veined, with only one prominent vein visible for much of the length of the cigar. The pack is very even, although I did note it was a bit spongy near the foot. Once clipped, the cold draw is deliberate but well within normal range, and provides a slightly sweet oat or undefined grain flavor profile. Before first light, it has a sharp leather and pepper aroma at the foot, and a similar but more faint aroma along the wrapper. The cursory sniff at the foot actually drew a sneeze from me with its spice. With the initial firing, the Brick House maduro starts out with a solid zing, mostly felt across the soft palate. Strangely, this peppery zing does not translate 100% through retrohale. The pepper is still there, but a bit more subdued. Behind this early spice lie flavors that are in line with – although different from – the noted oat/grain flavor on the cold draw. There is some sweetness, but it is NOT the light, baking spice or citrus you might imagine. It’s dark and chewy – almost leathery. By the middle portion of the Brick House maduro, it has really developed into the woodsy character I often get with Aripiraca wrapper leaf. As we’ve discussed on Half Ashed a number of times, I appreciate this much more than my co-host Craig. He’s not much of a fan….while I have identified it as a pattern in my enjoyment of a number of cigars and actively seek it out. I’ll take a moment here to mention that the burn and construction on this cigar has been dead-on in all respects. This is something that I too often overlook or take for granted, but feel strongly that it’s the very foundation of a good cigar. Tobacco selection, care, and blender’s skill are certainly key….but if a cigar is poorly assembled it’s all for naught. It’s an exceedingly rare occurrence to find a construction flaw in a JC Newman product – in both their Fuente-made products and San Rafael rolled lines. 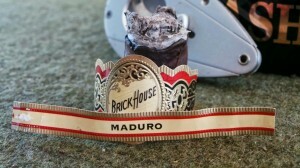 The Brick House Maduros I’ve had are no exception. Both have been expertly crafted. Coming into the final stretch, much of the earlier spice has receded and been replaced almost entirely with a mildly sweet woodsy family of flavors. Drawing from my years in wood furniture factories, it reminds me of Ash (fitting, right?) that has been machined a little too slowly – becoming heated by the tooling, but not quite burned. Ash has some inherently oaken characteristics, but is mild in aroma – hence my use of it for the illustration. I don’t want to overstate the woodsy tone of the cigar. Overall, it’s quite pleasant. The strength peaked during the middle portion of the cigar for me, although it was neither overtly strong nor mild at any point in the cigar. 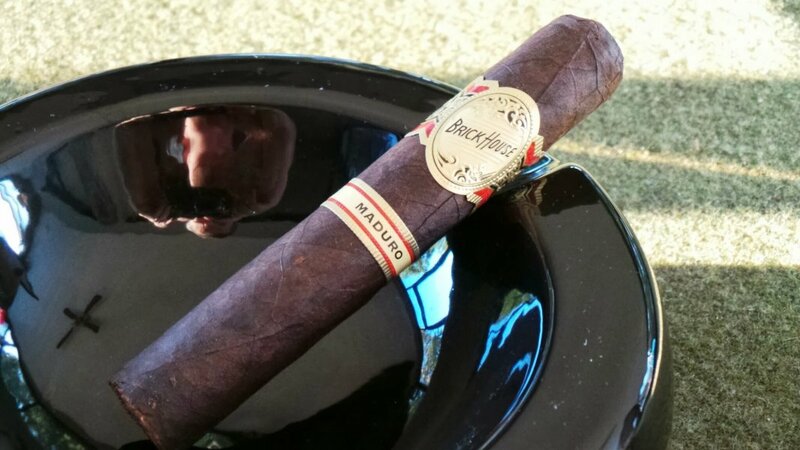 You will not forget you’re smoking a cigar, but I believe the Brick House Maduro is approachable for any level of nicotine tolerance. I’d place it firmly in the medium range throughout the smoke. The robusto is a welcome addition to the Brick House maduro lineup. As I mentioned earlier, I’ll admit I had not really found myself interested in the maduro line previously because it was only offered in the 6″X60 Mighty Mighty vitola. Being more of a corona-lonsdale-robusto kind of guy, I had largely overlooked it. With the addition of a robusto, it has added a new option for those of us who prefer somewhat smaller cigars – an option of which I’ll happily take advantage. I found the blend entirely pleasurable, and the Brick House is well within the confines of affordable pricing at a $5.15 MSRP. That makes for a homerun on the value scale for me. 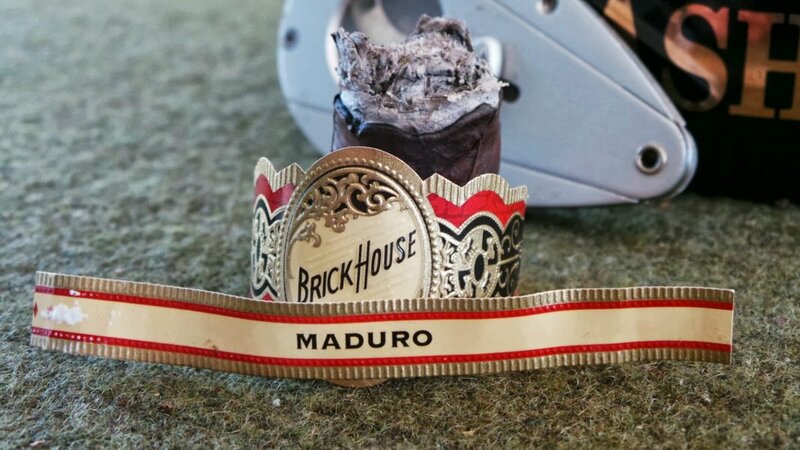 The non-maduro Brick House is one of my all time favorite cigars to fire up when nothing else jumps out as a particular craving. I know I can expect solid, classic cigar flavors and aromas with consistently good construction, and a fantastic pricepoint. This is a cigar I’ll buy by the box and stash in a readily accessible section of the humidor, for those times when nothing else will do. If you’re a maduro fan, an Aripiraca fan, or a Nicaragua fan (or any combination of the three), I think you’ll really dig the Brick House maduro…. Another great review Kip. I’m similar in profile but have found myself experimenting much more with so many great cigars out there! I’m a big fan of Brickhouse, but its been a long time since having one; been going allot with AJ Fernandez blends this year. Now I’m very much interested in a few Brickhouses and for those former “go to’s” to find their way back to my home humidor…especially this new maduro. My B&M thanks you as do l. Thanks Kip! I did not get all of your flavors from the Brickhouse that you did, but a have ”weak” taste buds. I did like the cigar, just a little strong, enjoyed the regular one better. 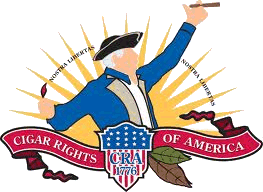 Have a cigar question, for the show, what do you mean when you say that the cigar has ”tooth”?